Fantastic news today as Arrow Stunts won the fan-voted EW poll for Most Likely To Earn Someone An Emmy Nomination (Stunt Co-ordination). 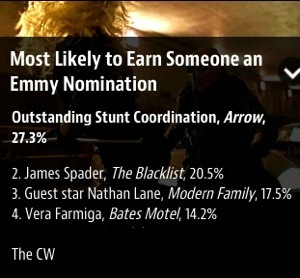 Congratulations to James, JJ & the best stunt team on TV! James and JJ accepted the award live on EW Radio. James told a fan via Twitter recently that there has been a submission for Arrow stunts under the name JJ Makaro for Stunt Co-ordination at The Emmys. The Emmy voting process to select the nominations occurs between June 9-20. Fans have rallied to support the stunt team with a series of trend attempts in June. Thanks to the stunt team for all the hard work, it shows on screen. Best wishes for all upcoming awards. 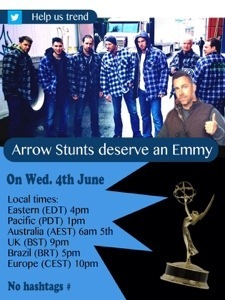 The Arrow Stunt department are definitely a fan favourite, let’s hope they are finally recognised by The Emmys.